It would be interesting to figure out the "unknown" parts of the TCB header that are currently just copied over when injecting a PNG. I don't remember if it properly converts all TCB files, but it currently supports 2 types (16 and 256 color). This is pretty useful for extracting TCB stuff from the DDR PS2 ISOs. You'll never know what you'll find in those TCB files! Glad to see so many discoveries have been made in this thread! Indeed, progress is (albeit very slowly) being made. *sad sigh* I just wish I could make use of that DWARF debugging data at the end of the PS2 executable(s) - since not just having function and variable names, but knowing where they go, would make everything a hell of a lot easier. Been trying to make sense of the documentation I can find on the DWARF format, and find myself getting lost quickly in the soup. Hey, if I credit you, would it be cool if I integrated this into a program I am trying to design and make to easily facilitate hacking DDR games? No idea if / when it'd ever be done knowing my busy schedule, but I thought I'd ask now so it'd be ahead of that ball. Try looking into documentation for CodeWarrior, since that seems to be the compiler suite they use. It might have information about how the debugging information is stored since it doesn't seem to follow DWARF 1 or 2 as the standards documents describe them. I remember it seemed like a hybrid of the two standards was used for the debugging information in DDR. Yes, absolutely! I had visions of a similar utility in the past to facilitate editing assets and adding/replacing songs from the FILEDATA.BIN file. Never got around to creating it but it's totally possible with knowledge of the formats used in the main data file. Hmm, I have a VM with the CodeWarrior compiler suite for Playstation2 development set up on it - documentation and all, I'll take a look, and see what I can find, if anything. I've created a new script called filedata-tool.py in https://github.com/root670/ddr-tools. This combines the existing dump and create scripts in addition to adding support for more games, accounting for "hidden" data missing from the file table in the game's ELF, and adding rudimentary filetype identification! I've tested dumping filedata.bin from Extreme, MAX JP, and MAX US and verified a newly created filedata.bin was identical to the original. I'm feeling a little disappointed that Saxxonpike hasn't seemed to incorporate into his work on the ssq format info from a fork I did a while back, as I did note a number of things I found important - and it would be nice if it were unified, rather than having the data all over the place. 1a. In Playstation 2 mixes, at least, the fact that the stepdata is all in one chunk. 1b. At the beginning of said chunk, there is an array of offsets (relative to the start of the chunk) for each piece of stepdata. 2a. In Playstation 2 mixes, at least, background movie scripts are stored in another chunk of data immediately following step data. 2b. The script data itself isn't stored in the stepdata file itself, and it doesn't SEEM like, at least, a script is even referenced in the stepdata file. 2c. There is a number of scripts equal to the number of songs in the game. 2d. Like with step data, at the beginning of the chunk, there is an array of offsets (relative to the start of the chunk) for each script. 2e. (speculation) Rather than storing the script in the stepdata, or even referencing the script in the data, the game just uses the same array element number to simultaneously access both the stepdata from the offset in the stepdata chunk, and the script data from the offset in the stepdata chunk. This would make sense, IMO, since upon selecting a song, the game is passed a value that when I altered it, changed what data was loaded. This made it abundantly clear that the value represents an array element number, and it'd be trivial to use that number to access the addresses in both arrays, seeing the that the scripts are in the same song order as the step data - which means that the same array element number would retrieve the correct/desired data from the correct element in both arrays. Plus there were some terminology cleanups that I did with regard to bits, bytes, nibbles, etc. EDIT: How do you guys rip the frames of the MJPEG videos? So I've been looking at the order in which the song data for the struct_info metadata, the stepdata, and the actual song files are stored in filedata.bin, and I am perplexed. My question is: when they went with storing the data on disk, how the hell did they end up choosing this particular order for the song data? It's not alphabetical, it's not in ascending or descending BPM, it's not by type (Konami Original, beatmania crossover, license, etc), or at least it doesn't appear to be that way, so ... what the hell is this order based on? How does this make any bloody sense at all? No clue. maybe it's their preferred order? And that order doesn't make any sense either. EDIT: It's the SAME order in AC. Hmmm, are you sure - at least with regards to them being totally different? I mean, going through Saxxonpike's guide did lead me to seeing the same things in the stepdata I was looking at so far as the data structure, et all. If you can figure the format it'll be awesome, then! Seems I've got some investigating to do then. The order of the list follows the "masterlist". It's probably in the order when they added/worked on the songs in general to DDR. I realize that if this is correct, that I might have to add cases, but in the MAX-era games, I could just use the space currently spent by the old debugging information (which can be as small as 208KB, or as large as 2,983KB (~2.983MB) depending on the game) - make a copy of the function there, modify it as needed, and then change the references to the old function so they point to this new function. Just made it so you could put down 3 arrows at a beat, in any combination of steps and freezes. The game doesn't interpret the data correctly in-song yet, but I am working on finding out where the stepdata is read and interpreted during a song, and seeing what changes are needed to make them appear properly in game. 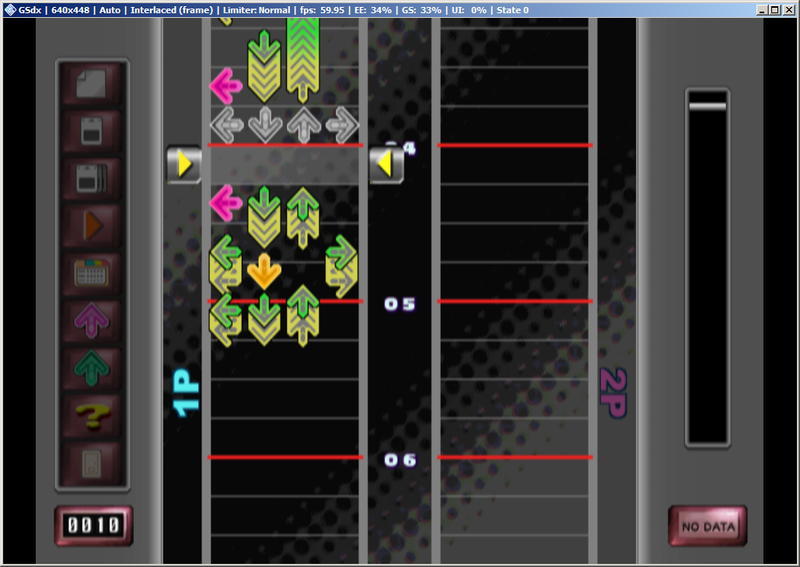 Enabling 3 steps on a beat was rather easy - there are 2 places in edit mode where it checks for attempting to put > 2 arrows on a beat - one for non-freeze steps, and one for freeze steps, both use a SLTI (Set on Less Than Or Equal) instruction to determine if the game should continue to place a step in edit mode or not on a particular beat - with 2 being the value checked against... changing this to a 3 or higher allows you to place 3 steps on a beat. I don’t think I have it on a memory card anymore but there was an era where making edits with 12ths on one side and not 12ths on the other then playing the chart on one player caused the game to get confused and attempt to merge the charts and sometimes resulted in triples and quads. Is that something you might have been able to get an answer for with your work in edit mode ? I’ve always wanted to know what caused it. I wish I knew specifically what I used to do to make it work but I definitely remember doing it at one point and being very confused by the result. I remember reading about that, and I think once when messing around with the game on consoles and having this happen too. That's something else I really wanna look into as well. FIRST POST HAS BEEN UPDATED with some information on the song selection screen, and how the data that gets loaded is picked. So, upon further research, it seems like there is more to the reading of stepdata than I had previously thought. By this, I mean that it seems like you CAN, upon enabling placing of 3 arrows per beat, have certain combinations work - BUT, you can only have 2 of each kind of step (non-freeze and freeze) on a beat in order for it to show up. That means 2 non-freeze + 1 freeze steps, 1 non-freeze and 2 freeze steps, as well as 2 freeze and 2 non-freeze steps, will all show up correctly, while 3 non-freeze steps, 3 freeze steps, 3 non-freeze + 1 freeze steps, and 1 non-freeze and 3 non-freeze steps, will NOT show up correctly. But this is not certain, and I need to keep experimenting with things. There are two memory addresses. One has a value that starts at 0, the other begins at a predefined value which changes depending on the song. The first memory address has a value added to it. When the value in the first address becomes equal to the value in the second value PLUS 0x762, the song playback is ended. But what the hell is this value? It can't be the total seconds the song is played, as each value is too large for that. The size issue also seems to rule out the value being in frames - as even at 60 FPS, the values come nowhere near the values above. For example, Burning Heat is approx. 1 min 35 seconds, or 95 seconds long * 60 fps = 5700 in decimal, which is 1644 in hex, far below any of these values. I wonder - when you have time, would you pursue making a compressor for the LZ compression Konami uses - every Konami related LZ tool I could find couldn't get it quite right. I MAY have found the decompression routine in the DDRMAX2 JP executable, and I'd imagine the compression routine is there as well, so I will be working on this as well. Could be counting beats and/or measures.